This is my 100th piece here at the Cranky Beer Blog, so why not do something incredibly different, review wise.. Non-alcoholic beer! I can hear the beer snobs laughing as I type this.. This is the first time reviewing a non-alcoholic beer. With it being the holiday season, it's a time to practice drinking in moderation. For hosts, this means stocking up on alternative beverages for those who don't want to drink, or want something to drink, but not get drunk. Usually I end up being DD when my family gets drunk, so I crave a good beer quite often, but that usually doesn't happen. 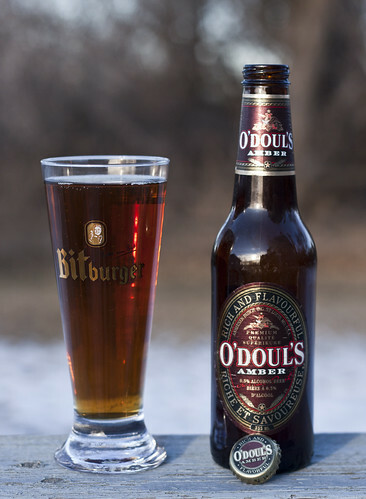 This review is of O'Doul's Amber. A low-alcoholic beer at 0.5% ABV made by Anheuser Busch (AB InBev) out of St Louis, USA. Appearance: Strangely enough, very rich in colour, a coppery caramel amber colour, clear, but not too clear. Very little foam, but there's a bit of carbonation there. Aroma: Caramel malts, quite malty in fact. Overall Thoughts: I was expecting the worst out of this beer. It's not a good beer on any level, but for the price ($7 for 6 bottles depending on retailer), it's a better deal than the "Premium Quality" European beers that taste like grainy crap. Oh wait, this "beer" also has the words "Premium Quality" on the label.. ugh (Friends don't let friends drink "Premium Quality" beer). I'd never drink this again, it's not tasty in any sense.. mostly malty caramelly water. But I just can't believe it's better than some European lagers on the market today..
Lastly, compared to Labatt Blue 55, which has 2.5% ABV (compared to this with 0.5% ABV), this likely has more flavour, but more calories. Edit: I am getting a bit of a stomach ache, so if you don't see any more blog entries from me, this was my downfall, as this beer was made on June 3, 2006. Damn.. I was living in Quebec then! From the label: Two row & specialty caramel malts with imported & domestic hops gives O'Doul's amber its rich flavour.